Last year, following the events of the Arab Spring, Egyptian activists and bloggers gathered in Cairo to participate in an open format dialogue on the question of Islamism in their country. One main difference between this event and other conversations that may have been occuring at the same time, however, is that each speaker was limited to 140 seconds – an oral version of Twitter’s 140 character limit for tweets. This format was dubbed a “Tweet Nadwa” – nadwa being the Arabic word for forum or symposium. The first Tweet Nadwa focused on the role of the Muslim Brotherhood in Egypt’s future. 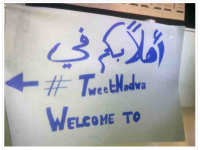 Hundreds of Twitter users gathered together in a room with a large screen that had been erected to display the Twitter page created for the Tweet Nadwa, streaming all the messages and photos related to the meeting. Those who could not attend the event in person were still able to participate remotely by tweeting their questions to those in the room. The second Tweet Nadwa examined the origins of the country’s revolution and discussed motivation behind social change in Egypt. Through this innovative format, based on the rules of a Twitter conversation, everyone is encouraged to participate and offer any views they may wish to express, as long as they are not deemed offensive. Each speaker has 140 seconds and during that time is not interrupted. A moderator picks who speaks and keeps strict time, cutting off speakers if necessary. The result is a fast-moving, participatory, diverse discussion format for social justice issues. While it was Egyptian activists that initiated and popularized the format, it could easily be adapted by other groups to facilitate dialogue on a wide range of issues. The Tweet Nadwa could be an interesting experience for those working in human rights NGOs, universities and schools, governments, or other organizational contexts.